Барааны дугаар Байхгүй. Categories: Dictionaries, OXFORD. 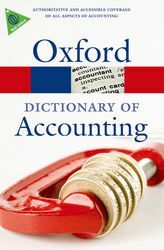 This best-selling dictionary includes more than 3,700 entries covering all aspects of accounting, including financial accounting, financial reporting, management accounting, direct taxation, indirect taxation, auditing, corporate finance, and accounting bodies and institutions. It boasts feature entries on key areas (e.g. Bankruptcy Law and the FTSE share indexes), and its international coverage includes important terms from UK, US, Australia, India, and Asia-Pacific. Over 250 new entries have been added to this edition to reflect the very latest developments in the accounting profession, e.g. the growing importance of International Accounting Standards, recent legislation, UK tax changes, and reliefs and allowances (e.g. Entrepreneurs’ Relief, Annual Investment Allowance). In addition, coverage of taxation, finance, and audit has been increased and all entries have been revised to ensure they are up-to-date. With its authoritative and straightforward definitions and its wide-ranging coverage, this dictionary is essential for students and professionals in accounting and finance. It is also an ideal source of reference for anyone seeking a clear guide to the often-confusing world of accountancy terms. Readership: Students of accounting and finance, MBA students, accounting professionals, and anyone who encounters accounting terms in their work.